Cut the cake left to right Croatian Col Drazen Bartolac commander of the Simulations Training Center, Col., Kenneth Schecter, 50th IBCT commander, Chaplain (Maj.) Jerome Fehn, and Spc. 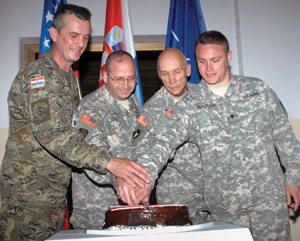 Gabriel Beaufeaux, both of the 2nd Combined Arms Battalion, 136th Infantry, celebrate the Army's Birthday June 14, in Zagreb, Croatia, during Immediate Response 11. The chaplain and specialist represent the oldest and youngest Soldier in the ranks for the ceremony of the Army's 236th Birthday. ZAGREB, Croatia — Twenty-five Soldiers from the 50th Infantry Brigade Combat Team trained with the Croatian Army at a command post exercise here called Immediate Response 2011. Serving as the higher headquarters for the Minnesota Army National Guard's 2nd Combat Arms Battalion, 136th Infantry, the Soldiers from the 50th IBCT trained at the Croatian Armed Forces Leader and Staff Simulation Center from June 4 – 19. The exercise, which included a field training exercise at Slun, is a multinational operation hosted by the Croatian military that includes more than 1,000 participants from U.S. Army Europe; Minnesota, New Jersey, Texas and Utah National Guards; the United States Air Force and service members from Croatia, Montenegro, Germany, Albania, Bosnia, Macedonia and Serbia. The two-week exercise is primarily focused on company level training aimed at improving U.S. interoperability with allied and NATO forces and helping Croatian forces prepare for deployment. "This is the first time we conducted an exercise like this overseas," said Col. Kenneth Schechter, the 50th IBCT commander. "While our mission was to exercise the Minnesota battalion and work with our Croatian counterparts, the byproduct of what we did was to exercise our own staff," said Schechter. The exercise was based on counterinsurgency operations in an Afghanistan province using both military forces and civic actions in order to defeat the enemy. The exercise used the Joint Conflict and Tactical Simulation system, which is used for command level training. Laptops and desktop computers filled brigade and battalion headquarters tactical operations centers. Other systems worked within the exercise included the Command Post of the Future and the Blue Force Tracking systems, which allowed some real-time training for U.S. and Croatian Soldiers. Croatian Army 1st Lt. Marko Skovrlj served in two roles during the exercise. The first was as a Civil Military Cooperation officer with the 361st Civil Affairs Brigade, an Army Reserve unit from Kaiserslautern, Germany. Within this role, Skovrlj served as a liaison between the military and non-military community leaders and nongovernmental agencies coordinating humanitarian efforts in the simulated war-torn province. The second was to serve as a public affairs officer and track newsworthy events happening around the battle space. "It was a very good experience and a pleasure to work with people with so much experience," said Skovrlj. "It was interesting to watch American military doctrine." Capt. Stren Lea, a brigade battle captain, worked directly with a Croatian counterpart during the training event. "We are very fortunate to be able to share our training experience with our coalition partners," said Lea. During the exercise, many Soldiers held two positions while serving as a higher headquarters for the battalion. One of the Soldiers, Spc. Matthew Ziegler, served in operations and communications. And during the preparation phase of the exercise, the young Soldier set up or moved computers for the event. Consequently, Ziegler became the go-to guy for technical support during the exercise. Ziegler said he was most impressed with the training and working in a tactical operations center. "It was a good experience for those Soldiers who have never worked in a TOC," said Ziegler. "The overall scenarios used for the training were very realistic." "Working in a multinational military force is very interesting because they learn from us and we learn from them," concluded Ziegler.